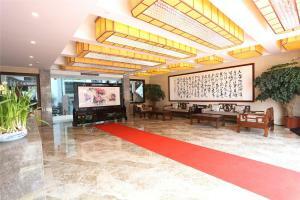 Offering free WiFi, Hanting Express Xuzhou Jiefang Road offers rooms in Xuzhou, 6 km from Mausoleum of Chu Dynasty. The property is around 5 km from Western Han Dynasty Terracotta Warriors and 10 km from Jiangsu Normal University. Attractions in the area include Xuzhou Amusement Land, 11 km away, or Downtown Area, set less than 1 km from the property. The nearest airport is Xuzhou Guanyin Airport, 45 km from the hotel. When would you like to stay at Hanting Express Xuzhou Jiefang Road ? Each day we'll check prices and send you an email for your selected dates at Hanting Express Xuzhou Jiefang Road. If you don't have specific dates but would like to check prices for say next weekend or say next month we can check the price too. Click to write a review and share your experience of Hanting Express Xuzhou Jiefang Road with other travellers.